BLOKFEST: Important 3rd season changes! 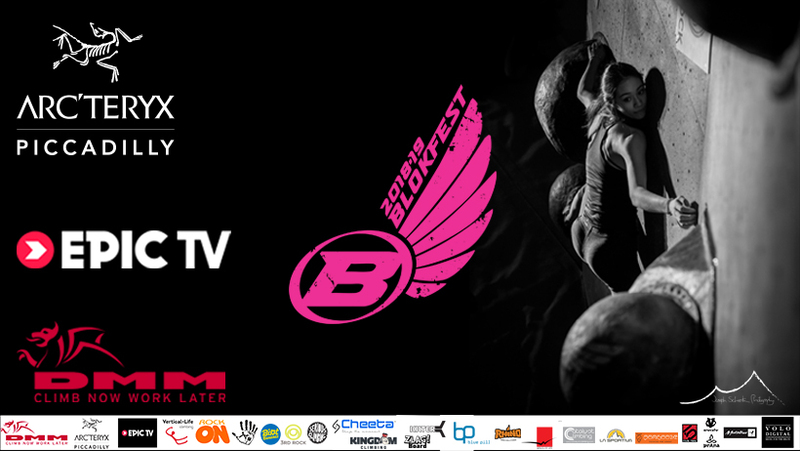 Only a few weeks away from the start of what is set to be an epic 3rd season of Blokfest. We have awesome venues, holds, volumes, DJs and much more lined up for you and to help make things continue this way we have a few important changes this season to be aware of. We have reduced the overlap from 1.5 hours to half an hour by making the juniors start time slightly earlier and reducing their overall time to 3.5 hours instead of 4 hours. This was not an easy decision to make and we were stuck between a rock and a hard place really with this one but justified this move by the fact that the Juniors are overall a smaller group size in terms of numbers of climbers compared to the adults. Also looking back we felt the majority of juniors finished within the allotted 4 hours anyway and a lot of the Juniors always arrive super early (no doubt much to the parents' delight). This new timings will help make a much nicer climbing environment and safer for all involved which is so important and we thank you in advance for your understanding in this move. Blokfest is and has always basically been run by volunteers. As the three main organisers we have to volunteer the majority of our time to make these events even possible. Why do we do it? Who knows - I guess it’s just too much fun seeing everyone have a good time and climbing their best. However since we started we have had the same pricing scheme and that was based on trying to cover our expenses so these events can continue year on year and as the events have grown and we try and pack more and more into Blokfest the expenses have increased. This does mean we have had to bump the entree price up by £5, under 18s will now be £15 and Over 18s will be £20. Compared to other events of this scale and what you get packed into the day we hope you still see this as excellent value. Don’t forget you still get your free one off Blokfest season t-shirt or vest and the opportunity to come away with some of the thousands of pounds worth of sponsor gear give-aways! At Blokfest HQ our aim is to support this great sport and one of the many ways in which we were doing this was by supporting Team GB members by giving them free entree. Although a number of the team athletes were either donating a contribution or paying full price entrance anyway we have had to make the call for standard entree price for everyone. As much as we would love to continue giving free entree over the last two season we have affectivity donated over a £1000 to the GB team. If we continue this it will start to effect the standard of the events for the majority and Blokfest would struggle to survive. However we will continue to support our GB climbers by providing the very highest quality of event with first class route setting and frilling finals at an international standard. We hope that these changes this season will help make these events safer, more fun and forever improving. To help you make up that £5 increase here are 10 extremely serious £5 saving tips before the season starts. 1. Only ever campus at the climbing wall as to not wear-out the fronts of your shoes. 3. Only ever wear your Blokfest tops even at work – saves buying clothes – they are expensive! If you have to buy clothes use Rock-On they are cheap and mega just look at Dom’s shorts! 4. Always knick your mates chalk who reckons he/she is either too busy to enter Blokfest or only likes “climbing outside” J. 5. When climbing indoors do not bother with routes as belaying = not climbing time. Time is money! 6. When watching Blokfest finals be sure to befriend a very tall generous person so they can catch the free booty being thrown out before everyone else. 7. When paying at the first Blokfest event bulk buy for the whole season and get a discount. 8. If you lose your chalk bag do not BUY a new one before Blokfest instead beg for a new one from one of our sponsors or from Gaz Parry (he has way to much stuff)! 9. Go on a diet – food is expensive! 10. After a hard climbing session drink protein shakes not beer. £4.50 a pint! However if you do need to go the pub don’t go with a climber - their too tight fisted, especially Gaz! See you at Westway October 25th .